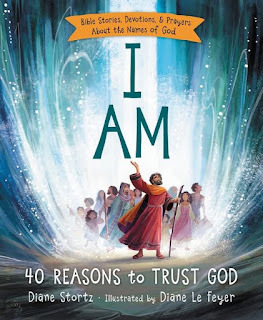 We have found a truly beautiful book to share the names of God with kids. This is one of our all time favorite books! My 11 year old is using it for her morning devotions and hasn't missed a day. I was recently reading a book on the Names of God, and was so excited that they had one in a kid version like this. by Diane Stortz and illustrated by Diane Le Feyer. Each of the 40 devotions has the name of God in English, and then in Hebrew or Greek, with a pronunciation guide. . It also tells you where it is located in the word, and a story of a Bible character to go along with when the name was used in the Bible. The devotional part looks deeper at the story as to what it means and how it applies to you. There is then a simple prayer at the end. For older kids or to do along with the young ones, there is a Learn More box where you read additional passages in scripture. The illustrations are absolutely gorgeous. Some of them are turned sideways to the vertical to capture the essence of the story. My daughter snagged this book as soon as it came and has really been loving it, and that makes me feel so blessed. After my daughter is done with this, I am going to use it as a morning devotions with my 8 and 1 year old. She loves books and I want to instill these names for her to have tucked in her heart. Enter to win a copy simply by leaving a comment! Let me know a name of God or Jesus that really speaks to you. Let me know how you would use this devotional. Ends April 15 at midnight and I will use random.org to find a winner. Son of God for Jesus is one that has always spoken to me! Jehovah Rapha - the God Who Heals speaks to me the most.